Tip on Machine (Keeper Cards) | Mail-O-Matic Services Ltd.
Mail-O-Matic provides fugitive glue and glue dot services to temporarily secure items onto your documents. This is an ideal process for self-mailers or attaching credit cards, bank cards, store cards, identification cards, and more to mail out contents. The easy-to-peel adhesive makes it easy for content insertions to be removed. Envelopes may also be opened and resealed. 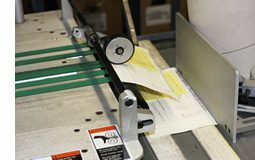 Our automated tip-on machines place the right amount of fugitive glue on the intended document, such as brochures, flyers, magazines, letter inserts, and more. If you need to include an item that needs to be secured into your mail outs, our fugitive glue is the perfect solution. Mail-O-Matic is a full service direct marketing company providing professional fugitive glue and glue dot services you can trust to securely and temporarily attach items to your important documents. Contact Mail-O-Matic today and ask about our Fugitive Glue and Glue Dots services.